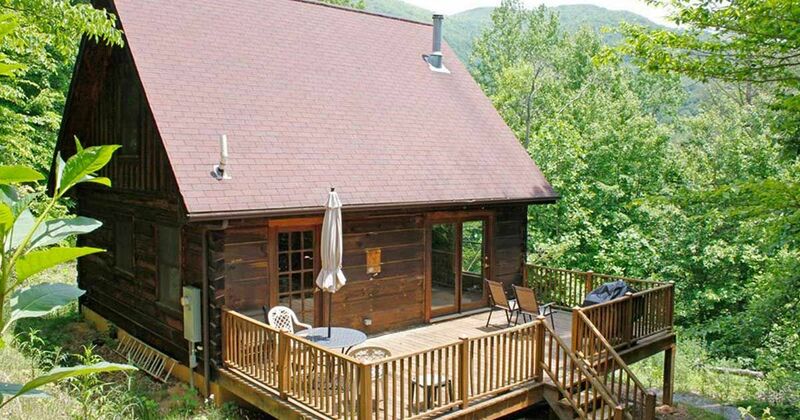 Near Asheville, N.C., surrounded by impossibly green foliage, one can find this tranquil Scandinavian-style cabin. Don't let its rustic exterior fool you — the owners have seamlessly melded antique pieces and modern amenities for a truly unique aesthetic. 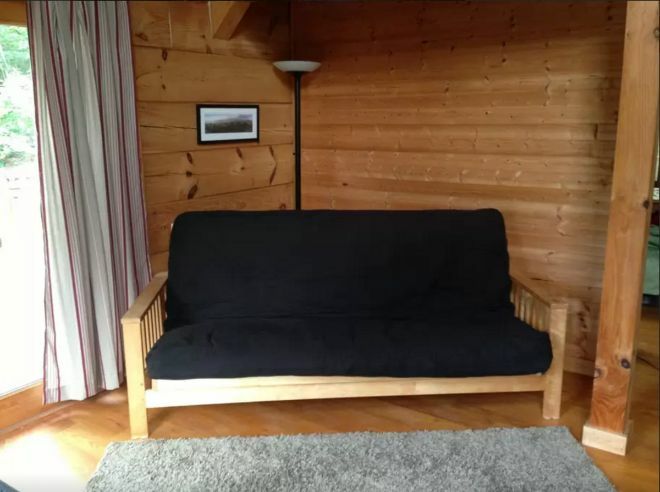 According to the AirBnB listing, the interior of this A-frame cabin was largely inspired by a family trip to Norway and Sweden, particularly their use of exposed wood and uncluttered, minimalistic decor. 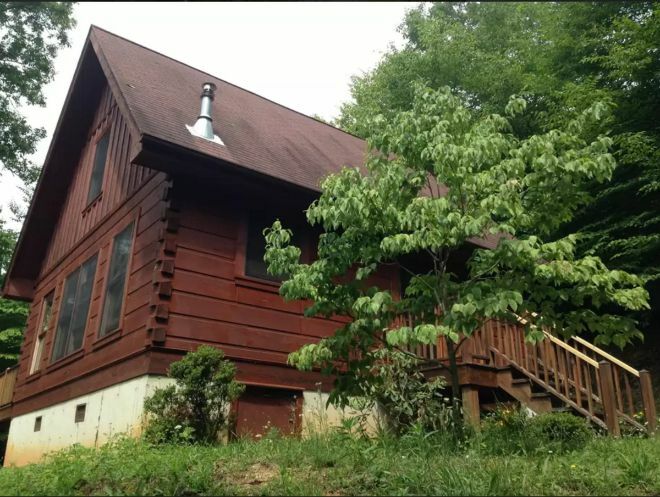 It's is located 20 minutes from Asheville, so the cabin is still secluded without being completely cut off from the rest of the world. 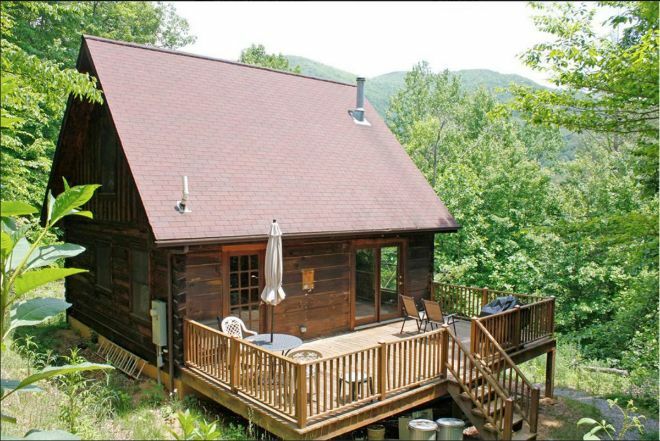 Despite its small size, this 800-square-foot marvel maintains a feeling of openness. The two-story abode features cathedral ceilings and more than enough windows, allowing light to fill the space beautifully. 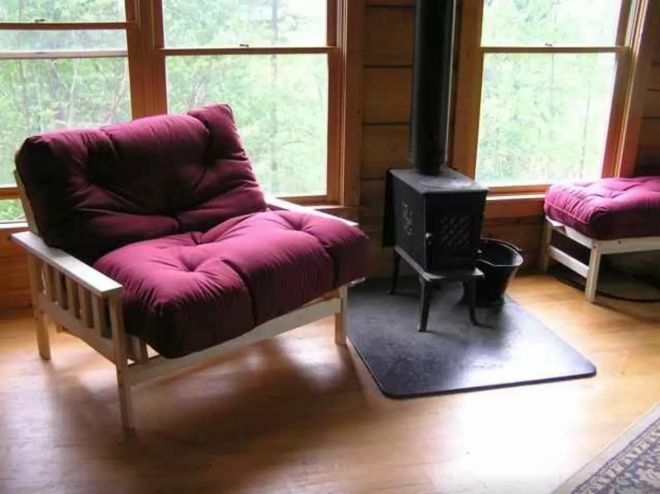 The love seat and ottoman are adjacent to a wooden stove with a chimney that extends all the way up to the top of the cabin. 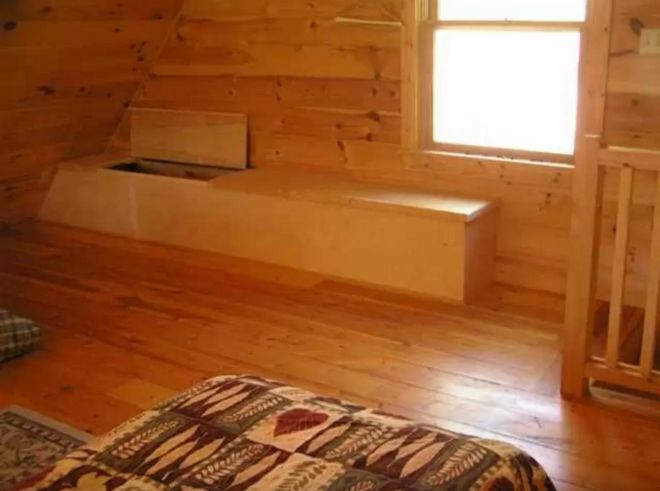 The assorted seating — including a futon — means that, if necessary, the cabin can sleep up to seven. 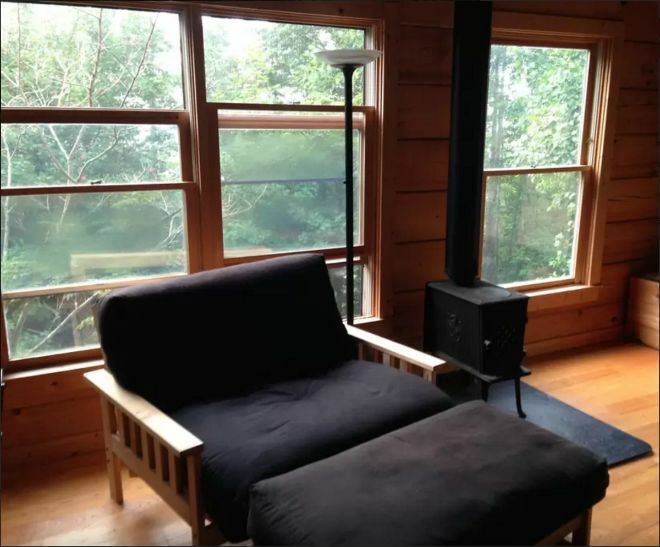 Otherwise, the abundance of comfy options makes the cabin ideal for lounging. 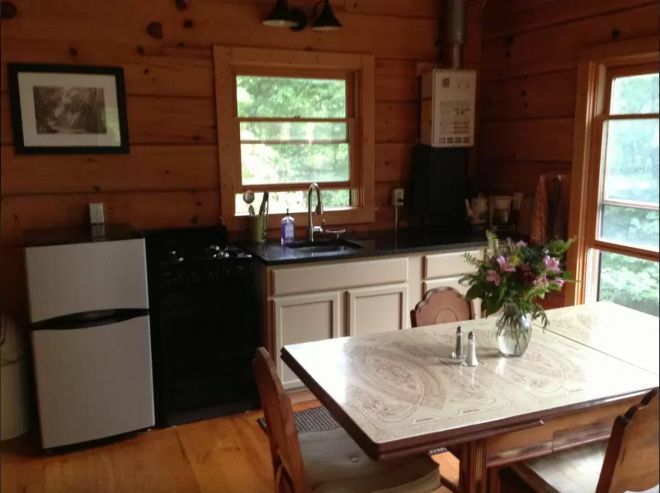 The kitchen is equipped with a 4-burner cooktop stove and granite countertops. 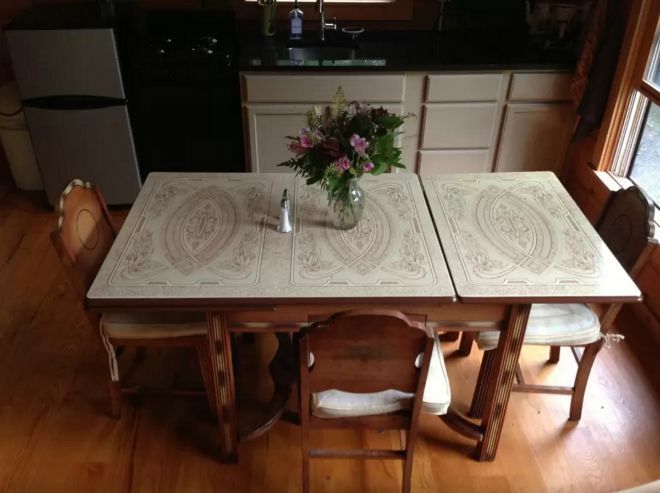 The sleek new amenities contrast beautifully with the antique dining table, working together rather than clashing. 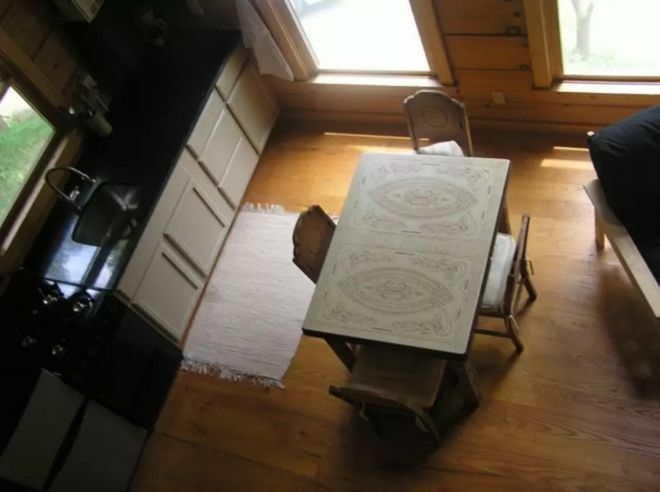 Here is the kitchen and dining room as seen from the sleeping loft. This table is an absolute treasure. 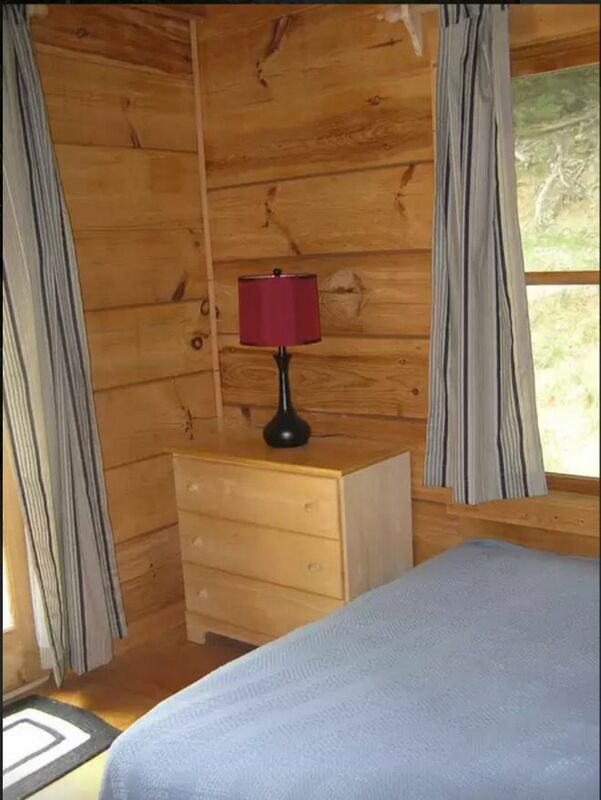 The private bedroom downstairs accommodates a full-sized bed and gets the prefect amount of light. 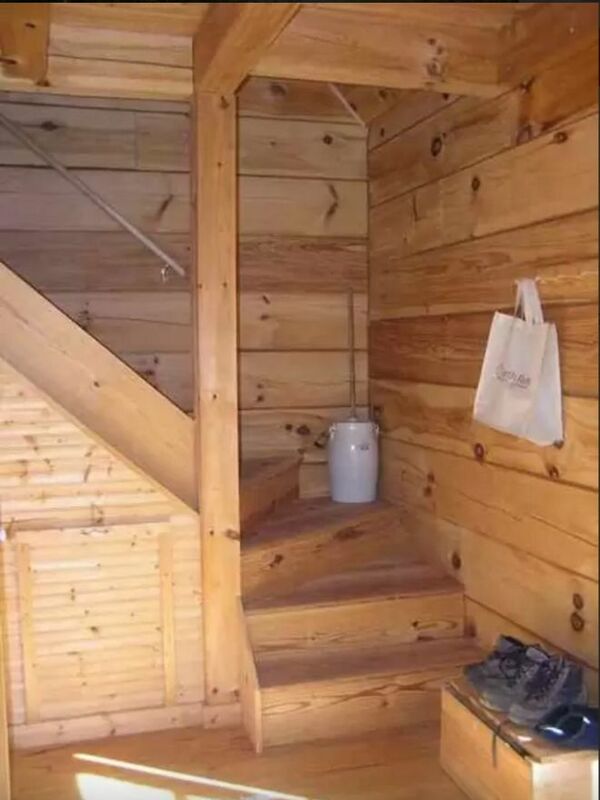 The sleeping loft is accessible via a beautifully-constructed staircase. 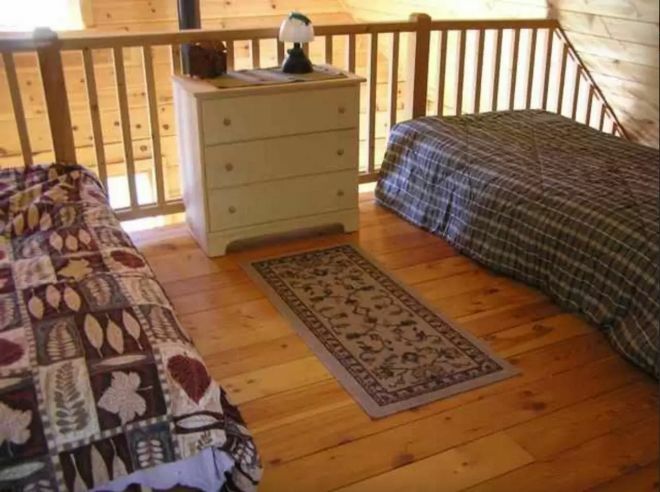 The loft contains two twin beds and a dresser that can double as a nightstand. 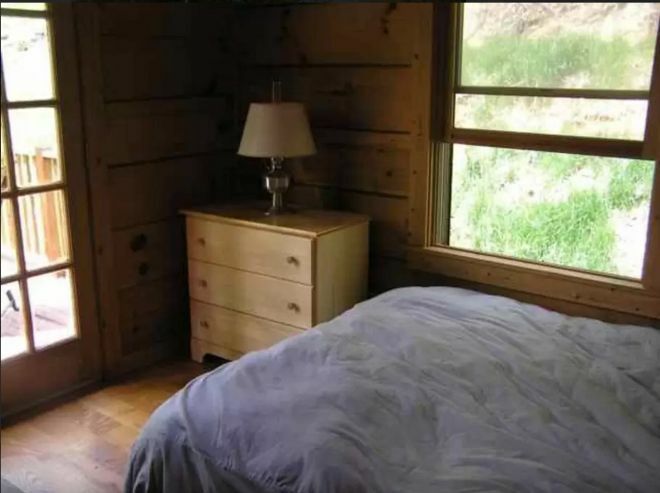 For additional storage, there are secret compartments against the wall of the sleeping loft. 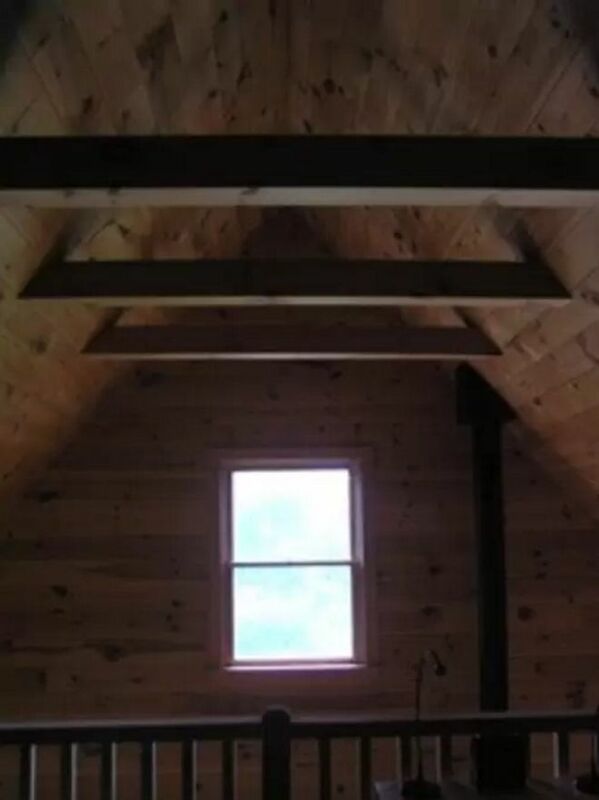 The view from the top isn't bad, especially with this gorgeous vaulted ceiling. 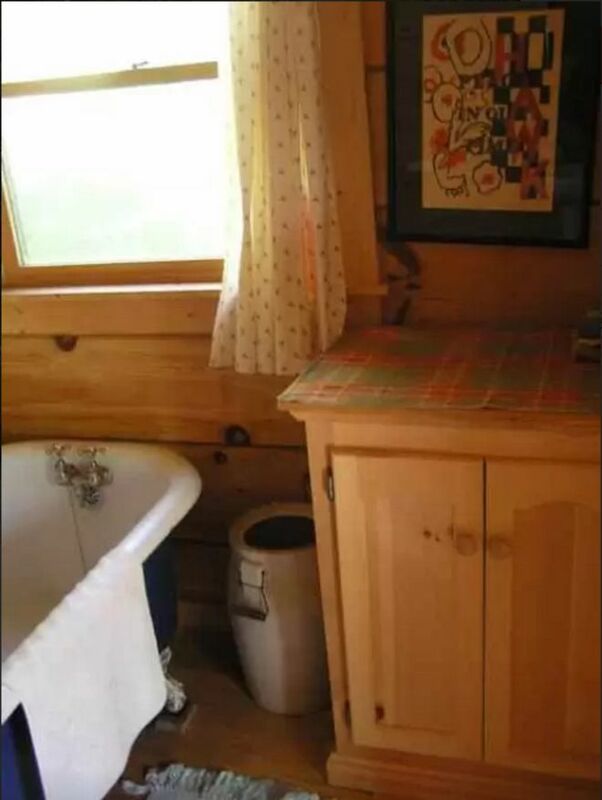 Even the vanity in the bathroom is constructed from the same wood. 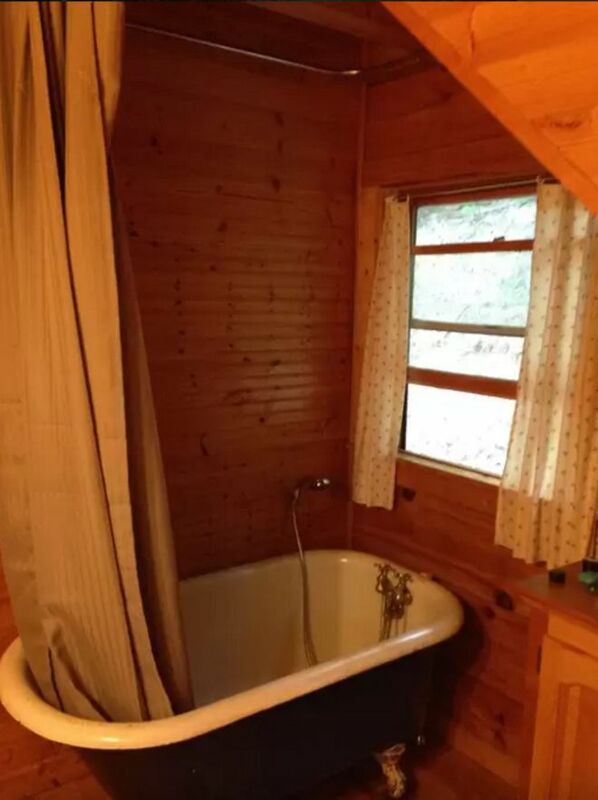 Feast your eyes on this antique clawfoot bathtub and hand-held shower. 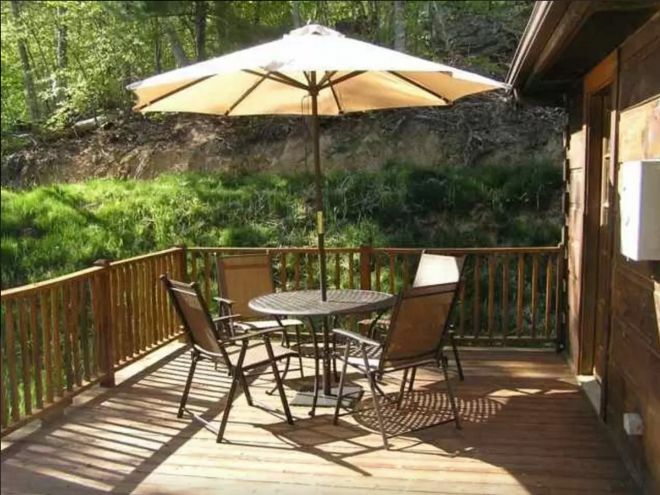 The large deck invites you to dine al fresco, and apparently is much larger than the photos let on. 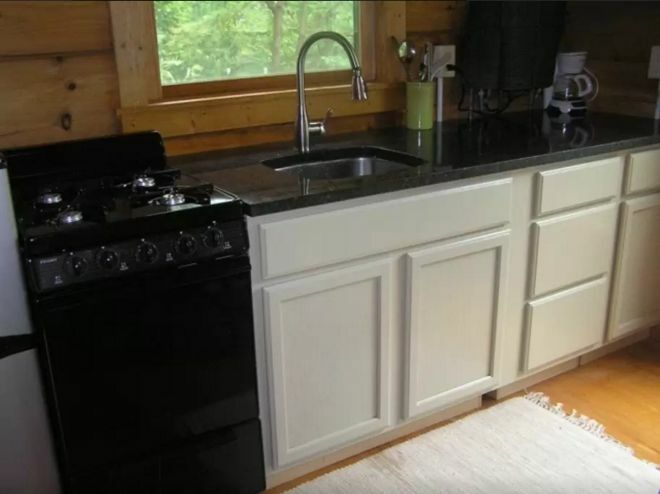 There is also a gas grill, should you decide to throw a barbecue. Have you started packing your bags yet? Don't forget to SHARE with your friends! This is the perfect living room. Take a peek and see for yourself. Meadowlark Log Homes has 4 decades of experience in craftsmanship and the Green Gables cabin is just one tiny - but gorgeous, example of the quality of their work.